Join me on Friday, October 10th at 8:30pm to learn about electrical play! Violet Wands, Neon Wands, TENS Units, PES Units and the wide variety of electrodes on the market today will be discussed as well as safety and ideas about how to bring electrical play into your bedroom. I’ll also be teaching a class on Dominance for beginners on Saturday October 11th at 8:30pm! 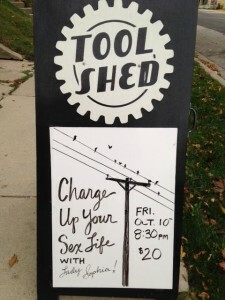 Come learn about electrical play with me at Tool Shed in Milwaukee, WI on Friday October 10th at 8:30pm. Tools Shed on Twitter & Facebook!